Ok, let’s be honest here. Unless you are a safety professional, or you work closely with safety professionals, the chances are that no one has really told you anything about pipe marking, right? But for those of us lucky enough to work in this industry, it quickly becomes all too clear that there is an endless amount of information available about this very narrow topic. 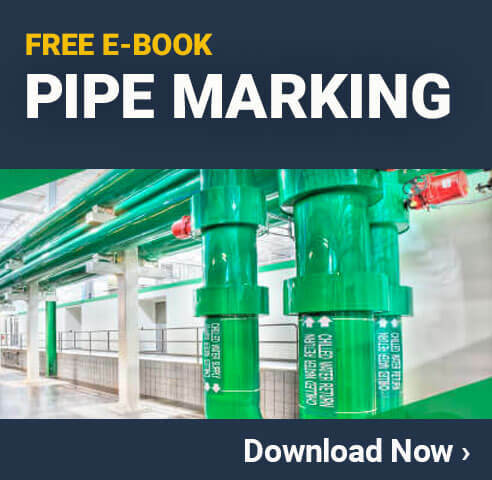 Unfortunately, about 99% of the information that people learn about pipe marking is just reiterating the standards and regulations that are put out by OSHA and other regulatory bodies. Now, make no mistake, this information is absolutely critical to learn and follow. The fact is, however, that there are A LOT of other things that someone who works with pipe marking should know. We’ve put together some helpful tips, tricks, information, and advice that covers a wide range of pipe marking related topics to help ensure your pipe marking strategies are as effective as possible. If you have any other ‘secrets’ of pipe marking that you don’t see here, please contact us below so we can help pass them along in the future. Pipe Materials – Did you know that normal vinyl labels can cause corrosion on pipes made of nickel and stainless steel? If you have this type of piping, make sure you opt for labels that are identified as ‘low halide’ to avoid this potentially disastrous risk. Know the Weather Risks – When labeling outdoor piping, you need to keep weathering in mind. 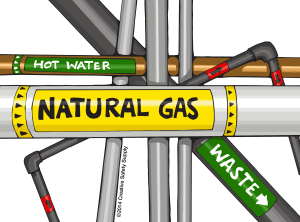 Most label materials are water-proof, but the constant change in temperature, humidity, wind, and more can really be rough on pipe markings. Choosing the more durable 10-year label supplies can help ensure your pipe markings can stand up to just about anything mother nature throws at them. Watch for Direct Sunlight – Sunlight can cause fading on many labeling materials so make sure you consider the potential for sunlight both now, throughout the day, and throughout the year. If a label will be ‘hit’ by the sun, choose a fade-resistant label supply to avoid this issue. In many situations, the colors that are used on the labels are determined by OSHA or other regulatory agencies. For optional labels, or times when there aren’t any specific instructions covering color, it is important to really think about your color decisions. Unlike when taking on a home decorating task, you really don’t want the colors on your pipe markings to flow with the surroundings. Choose colors that are going to stand out from the pipes, the background walls, and even other markings. Things to consider when choosing your colors are how much lighting is there, is there high contrast between the text and the background, will the colors be easily visible throughout the day and night, and anything else that could impact visibility. One helpful tip is to use a LabelTac® 4 Pro printer and print off one label with a color scheme you think will work well, apply it to a pipe with just temporary tape, and then view the label at different times throughout the day. If it is always visible, you can apply it permanently. If not, make some changes to the colors and try again. While this may be time consuming, the safety benefits will be worth the effort. Ease of Access – Whenever possible, place your markings in a location that will be easy to reach by the cleaning crews so that they are more likely to get properly cleaned when needed. Frequency of Cleaning – If your labels will need to be wiped down or washed on a daily basis, choose a high-durability label supply. Even though all industrial label materials will stand up to everyday activities, it just makes sense to invest in something that will last longer when it is constantly being exposed to cleaning supplies and cloth. Air Cleaning – In many environments, labels can get covered by dust and other non-sticky substances. If a pipe marking is in an area that is hard to reach, using a quick blast of compressed air is a fast and easy way to clear everything off. There are many types of labels that are required, and regulations state where they need to be placed and how many of them there needs to be. What many people don’t realize, however, is that you can also add in extra labels in addition to those that are required (in most situations). If you believe it would be beneficial to the safety of your facility and employees to add another pipe marking to provide more information, that is a great option. Whenever working with pipe markings, or any type of safety efforts, it is always important to look for new ideas and strategies that will improve safety. Whether that is learning about some of the lesser known pipe marking information, or customizing your training to ensure everyone knows of a specific hazard in your facility, the path of workplace safety is truly endless.